Thus, if you follow a basic template for writing a Letter of Application--or any formal letter, actually--the task becomes much easier. Therefore, I would like this class not to obsess too much about letter-writing formats as a main activity or as a major part of your grade. I'm more interested in the body of your letter and how you "sell" your enthusiasm and skills to a potential employer, using a formal tone (or "register"). Specific formats tend to be highly subjective and capricious, based on different cultures and attitudes. 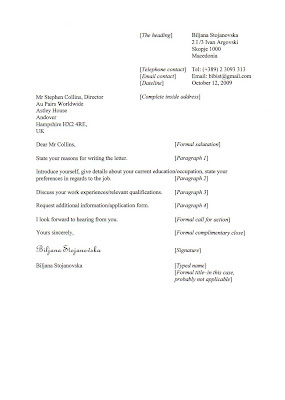 Even in the U.S., there are several ways to format a formal letter. So how to choose the "right" format? In the end, it really doesn't matter what "format" you select as long as your format is consistent and that you present all the appropriate information in a logical and coherent manner. So does it really matter if you choose use a partial block format or a full block format? Indented paragraphs? 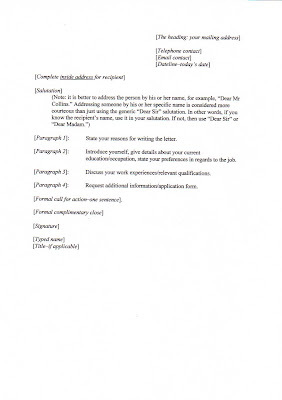 The body consists of approximately four main paragraphs, which present very specific information--well-written, of course--about the job applicant. For students, including a title is probably not necessary. The title is included when a professional is seeking a new job in the same or a similar field. 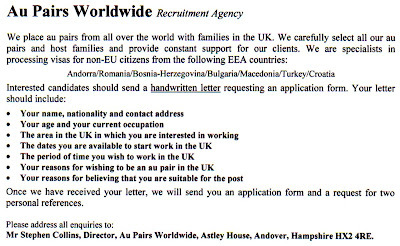 For class on October 19, please answer the ad for Au Pairs Worldwide, using a formal register (or "tone," as we say in the U.S.). I will consider this a rough draft, so it may be handwritten. You will be rewriting this, so don't worry too much about exact correctness. 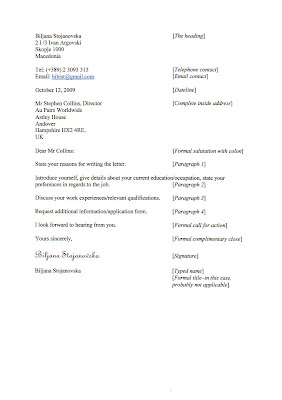 However, before attempting this letter, please read the above information. I will not be distributing print copies of this post, but I will place a copy on reserve in the library.